Last Wednesday (18th May 2011) right across the Blue Mountains, thick smoke choked the sky in a eye watering haze. By Friday, an artificial red sunset was blazing through the wood smoke at the end of two days of New South Wales government-sponsored bush arson. I knew exactly the ecological disaster unfolding, out of sight out of mind. In its annual misguided winter ritual, the National Parks and Wildlife Service (Wildlife Service), aided and abetted by the Rural Fire Service has deliberately setting fire to remote bushland across The Blue Mountains World Heritage Area – a ‘natural planet asset’ of which the Wildlife Service is international custodian. On Wednesday afternoon 18th May 2011, the aerial incendiary bombing commenced at Linden Ridge and extended down to the Grose River inside the Blue Mountains National Park (within designated wilderness within the World Heritage Area). Bushfire management euphemistically call it ‘hazard reduction‘ (HR) ; rejecting any notion that bushland habitat is a natural asset, and instead demonising it as a ‘hazard’. The Linden Ridge ‘ops’ follows an almost identical HR ‘ops’ conducted the same time last year on 12 May 2010 in which aerial incendiary ‘ops’ commenced around Massif Ridge some 12 kilometres south of the town of Woodford in wild inaccessible forested area of the World Heritage Area. Some 2500 hectares of high conservation habitat bushland in a protected wilderness area called the ‘Blue Labyrinth’ was indiscriminately incinerated – ridgetops, gullies, everything. Refer to previous article on this website: >’National Parks burning biodiversity‘. 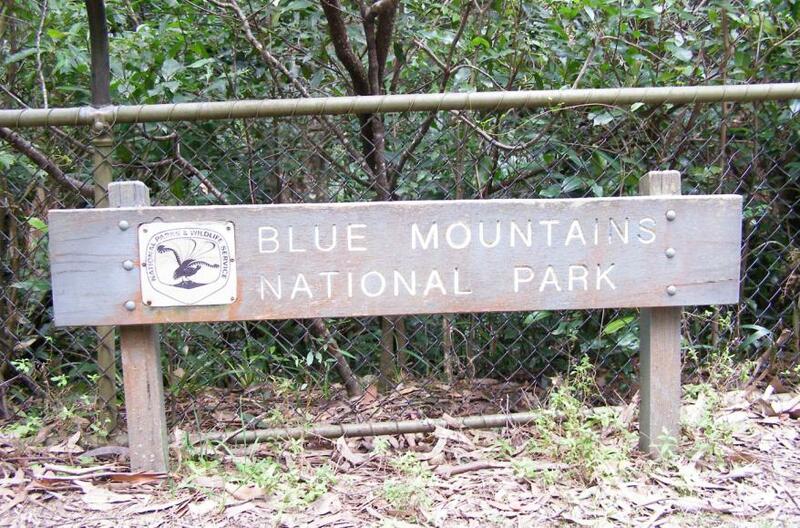 The same Blue Mountains National Park has been targeted by the same aerial incendiary bombing by the same Wildlife Service. Both the operations were carried out under the orders of the Blue Mountains regional manager, Geoff Luscombe. Click photo to enlarge, then click again to enlarge again and look for anything living. After a year look for the animals. After two years look for the animals…. Both the above HR Ops follow the massive conflagration of November 2006, infamously recalled across the Blue Mountains community as ‘The Grose Fire‘. Two abandoned lightning strikes coupled with HR Ops along the Hartley Vale Road and escaping backburns coalesced and incinerated an estimated 14,070 hectares of the Grose Valley and adjoining ridge lands, much of which is designated wilderness. Many consider the actions of the bushfire management response in hindsight to have been a defacto hazard reduction burn. With such an effective elimination of the natural ‘hazard’ that year, as well as the public outrage, HR Ops went quite for four years. How many animals native to this beautiful Grose Valley suffered an horrific burning death? How many of their kind have now perished forever from the Grose? …ask your Wildlife Service at Blackheath! Charles Darwin in 1836 counted platypus in the area. The perverted rationalisation by bushfire lighting theorists who have infiltrated the Wildlife Service is that the natural bushland, forests and swamps of the Blue Mountains World Heritage Area are perceived not as a valuable natural asset, but as a world ‘hazard’ area to be feared and ‘to be burned in case they burn‘. These same bushfire lighting theorists have effectively infiltrated, appeased and silenced local conservation groups such as the otherwise very vocal Blue Mountains Conservation Society, the National Parks Association of New South Wales and the umbrella conservation group the New South Wales Conservation Council. The local conservation movement’s complicity to sanction explicit broadscale ecological harm is a disgraceful and ignoble abandonment of cherished core values, and a breach of duty to faithful environmental membership. 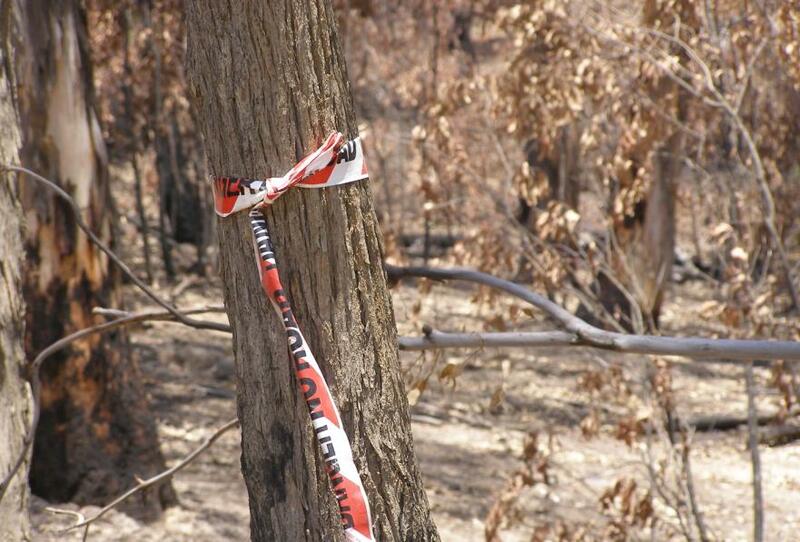 The Linden Ridge and Massif Ridge HR Ops were approved and executed by government in the name of ‘hazard reduction’ – to reduce the available ‘fuel’ (native vegetation) for potential future wildfires or bush arson. In both cases, the massive broadscale natural areas burnt were not careful mosaic low intensity burning around houses. This was broadscale indiscriminate fire bombing of remote natural bushland many miles from human settlement. How can the deliberate setting alight of bushland where no fire exists, where no human settlement requires protection from the risk of wildfire be construed but anything other than ‘government-sanctioned bush-arson‘? When bushfire management can contrive no other excuse for setting fire to native vegetation, such as when that vegetation is many miles away from human settlement and so poses no direct threat, out comes the concocted theory of the ‘ecological burn’. The ‘ecological burn’ theory starts with the premise that because humans have observed that the Australian bush ‘grows back’ (eventually) after a bushfire, it may be concluded that the Australian bush can tolerate bushfires. This hypothesis relies on evidence that selected species of Australian germinate after smoke and fire and the example of epicormic growth of many Eucalypts after fire. The first deductive fallacy of this theory is that all the Australian bush is bushfire tolerant. This deduction is then extended by unsupported assumption that since the Australian bush is bushfire-tolerant, bushfire must be an integral natural process to which the Australian bush has become adapted to bushfire. The assumption is then extrapolated to assert that bushfire is indeed beneficial to the Australian bush. The assumption is then stretched even further to conclude that without bushfire the Australian bush will be adversely affected. The ecological burn theory then prescribes that by burning the Australian bush, whether by natural or unnatural means, the biodiversity of the Australian bush will be improved. The perverted irrational logic that Australia’s native vegetation has adapted to recover from fire, is akin to claiming the human body is adapted to recover from injury such as burns. A wound may heal but no-one seeks to be injured in the first place. And not all wounds heal. 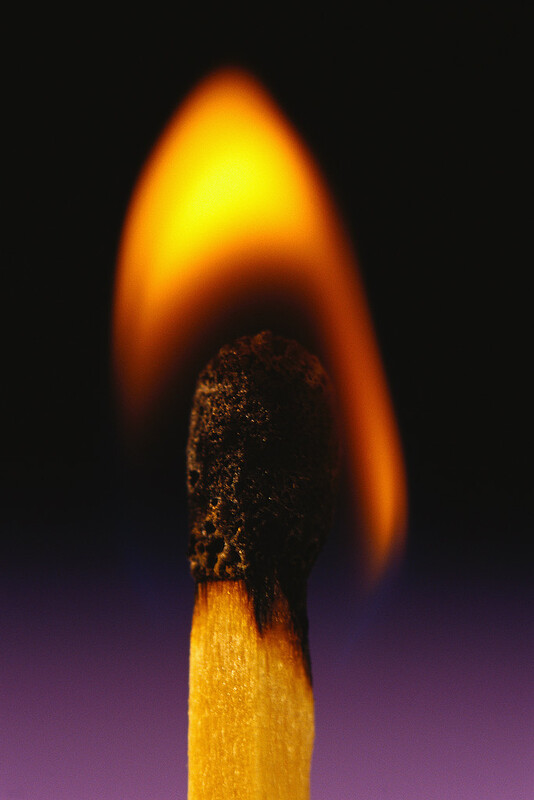 A third degree burn to more than 50% of a human body is almost a certain death sentence. What percentage of a wild animal’s body can be burnt and the animal still survive? That’s a perverted question for the fire-lighters. Broadscale hazard reduction is not mosaic patch-work fire. It is not creating a small scale asset protection zone around the immediate boundary of a human settlement. It is wholesale bush arson that is driving local extinctions. Ever wonder why when bushwalking through the Australian bush so few native animals are seen these days? Their natural populations have been decimated through two centuries of human harm – mainly poaching, introduced predation and habitat destruction including by human-caused bushfires and human-abandoned bushfires. The recent concept of the so-called ‘ecological burn’ is a contrivance, a myth. It is a false cause fallacy. Ecological fire a defunct scientific theory contrived by bushfire management engaging unemployed graduates to think up an idea for a PhD. It belongs in the same discarded bucket of defunct scientific theories from days of yore of such ilk as ‘alchemy‘, ‘phlogiston‘, ‘flat earth‘, ‘hollow earth‘ and ‘the birth cries of atoms’ theories. Yup, these were once believed. The effect on wildlife habitat by broadscale ‘hazard’ reduction is no different than if it was caused by wildfire or bush arson. The hazard to wildlife habitat is the same. The broadscale blanketing of bushland with high intensity burns that reach into the tree tops and scorching ground cover and earth, present the same intense fire regime. The landscape is laid to waste in just the same way as wildfire or bush arson does. 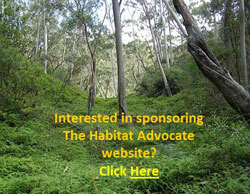 Habitat and the wildlife it accommodates become the innocent victims of horrific bushfire, no matter how caused. There is no wildlife monitoring before, during or after one of these aerial incendiary ‘ops’. Aerial incendiary guarantees no discretion between fire sensitive habitat and fire-resilient habitat. It is a simplistic, convenient a cheap one-size-fits-all solution that re-colours the fire maps to appease political masters. 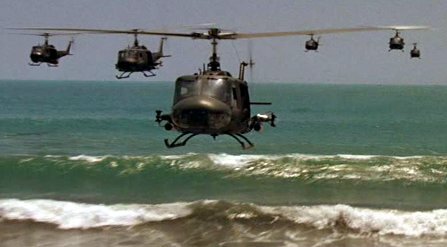 The chopper boys are given their bombing co-ordinates and then do their search and destroy mission. These airborne lads should apply their skills to good and not evil. They should stick to improving their water bombing skills, not participating in this perverted fire-lighting culture. When the rains follow, the thin yet vital topsoils get washed away into the gullies and streams. This erodes the landscape and prevents regrowth of many flora species due to the lack of vital nutrients. After both the Massif Ridge HR and the Linden Ridge HR, heavy rains did follow. 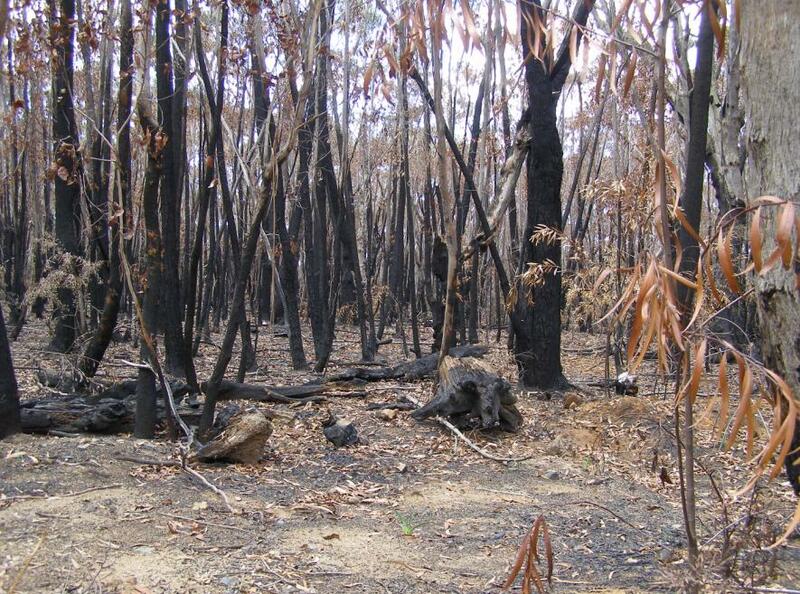 Only the species of flora adapted to bushfire recover. Fire sensitive species of flora are eliminated from the landscape. Name one species of fauna that is fire tolerant. Where are the zoologists in the Wildlife Service to tell of the impact of the HR? If this mob is providing a ‘service’, it certainly ain’t providing a service to wildlife. To put this area into perspective, in terms of the Blue Mountains World Heritage Area of about 1 million hectares, such a hazard reduction programme over a decade would decimate the Blue Mountains completely. And they call themselves a ‘Wildlife Service’? Once again thousands of hectares of pristine flora and fauna habitat in deep inaccessible terrain, miles from houses and human property, has been incinerated from the air using contracted aircraft dropping indiscriminate aerial incendiaries. If only these boys had napalm! This incineration of natural wildlife habitat is justified by the Wildlife Service as ‘strategic‘ and ‘hazard reduction‘ operations are one of many being conducted by NPWS around the state making the most of the dry sunny winter conditions. This burn is part of the NPWS annual fire management program. Then on Friday 20th May 2011, vertical plumes of smoke were seen rising from Cedar Valley south of the Jamison Valley ~ another one of these secret HR aerial incendiary black ops that the public is not supposed to know about? No notice on either the Blue Mountains Rural Fire Service site or the Wildlife Service site. Out of sight, out of mind. So how does aerial incendiary discriminate when setting fire to a contiguous 2500 hectares or 3000 hectares of wilderness? Answer: It doesn’t , it doesn’t seek to, it doesn’t care. The guidelines are only to keep the greenies happy. It’s called ‘greenwashing’. 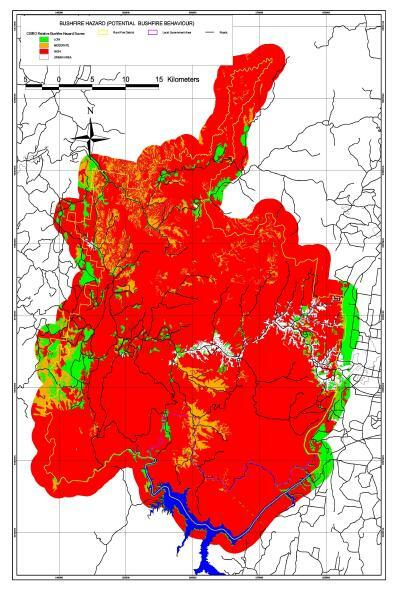 The Wildlife Service in its official Fire Management Strategy, has relegated 97.7% of the Blue Mountains National Park into either what it calls ‘Strategic Fire Advantage Zones’ or else ‘Heritage Zones. In essence, heritage Zones are valued natural areas that are protected from fire, whereas the Strategic Fire Advantage Zones are expendable. 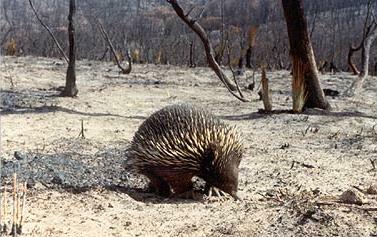 The Wildlife Service proclaims that …due to the ‘relative lack of practical fire control advantages’ (lack of access and resources), Strategic Fire Management Zones are ‘managed’ to protect community assets… to reduce fire intensity… assist in the strategic control… to contain bush fires and to strengthen existing fire control advantages. All of which simply means is that it is expendable and can and should be burnt in case it burns. Strategic Fire Management Zones ‘are considered priority for ‘treatment‘ – read targeted for broadscale indiscriminate aerial incendiary. So 2500 hectares of wilderness around Massif Ridge copped it last winter and 3000 hectares of wilderness around Linden Ridge copped it this winter. If it’ red on the fire map, burn it! What do these ecological vandals get up to deep in the wilderness at night with their matches and petrol drip torches out of the direct view of the public? They put up signs to deny public access to their nefarious activities. Out of the public view, they are out of sight out of mind. A cult is a group whose beliefs or practices are considered abnormal or bizarre. Starting large bushfires would seem to fit that definition. Fire-lighting is a cult of ecological deviance, just like any form of arson. “Where there are threats of serious or irreversible environmental damage, lack of full scientific certainty should not be used as a reason for postponing measures to prevent environmental degradation.” [Source: Principle 15 of the Rio Declaration (1992)] Such is the internationally agreed precautionary principle which Australia has adopted as a guiding principle of environmental management. The National Strategy for Ecologically Sustainable Development (1992) adopts the precautionary principle as a “core element” of ESD as does the Inter-Governmental Agreement on the Environment, and the Wildlife Service is supposed to be bound by it in its management of National Parks. The Wildlife Service once a trusted upholder of the science-based ‘precautionary principle‘ has of late succumbed to the more red neck bushphobic fear of the bush. What the general public hears about the Wildlife Service these days is its broadscale fire bombing of vast areas of vegetation in its ‘protected’ National Parks. This is confirmed these days by the wood smoke-filled air choking many communities and responsible for unknown volumes of smoke emissions contributing to net human-caused pollution to the planet – what many call ‘climate change’. Clearly the Wildlife Services respect for the precautionary principle is tokenistic, and wholeheartedly disregarded with its use of aerial incendiaries. The Blue Mountains delicate ecosystems are vulnerable to the indiscriminate fire regimes being imposed upon them. The burning into the tree canopy, the broadscale contiguous burning, the scorching of the landscape until bare earth can be seen is highly damaging to the many micro ecosystem across the Blue Mountains. When such burning occurs what happens to the micro-organisms, fungi species and the natural soil biota? The once trusted and respected Wildlife Service has lost its conservation way. It now spends more time, money and training on burning fragile ecosystems in its National Parks and exploiting those same parks for tourism exploitation, than it does on wildlife habitat rehabilitation. Sydney’s Taronga Zoo has become far more active and valuable in its urban wildlife recovery programmes than the Wildlife Service is in the wild. At the carpark above Katoomba Falls within the Blue Mountains National Park, a rather old and deteriorating sign put up by the Wildlife Service years ago, conveys a conservation message to park users. The last two sentences are particularly poignant in light of the massive scale of broadscale bush arson repeatedly being inflicted by the protectorate of the National Park – the Wildlife Service. If only the Wildlife Service would “leave nothing but footprints” and follow its own maxim. Indiscriminate bush arson of remote bushland in a National Park shows that the Wildlife Service has descended into a predatory wolf in sheep’s clothing. It’s management cannot be trusted with its custodial responsibility to protect the unique treasure of the Blue Mountains. Once I had a desire to embark on a career as a National Parks Ranger. Had I, in the end, I would have morally wrestled with the hypocritical politics and lasted less than the initial probationary period. I empathise with those who hold a personal commitment to ecology and environmentalism within the Wildlife Service. ‘Ecological Fire’ Myth. (as described above) Certain ”fire ecologists’ (a self-described term for many seeking to make this a lucrative profession) who are funded by bushfire management agencies, not surprisingly have conjured the academic theory that burning the bush is good for it because it increase biodiversity – just what bushfire management with their cheque book want to hear! They have conjured the term ‘ecological fire‘, which as a euphemism sounds good, so it must be good. So those setting fire to the bush may have no moral qualms. Crap. Show me any native fauna that proliferate after fire – ‘ecological’ or otherwise! Under-Resourced. Bushfire management is being repeatedly denied the necessary resources and technologies to quickly detect, respond to and suppress bushfore ignitions as and when they do occur, so there is a mindset of futile frustration that nothing can be done to stop bushfires frequently getting out of control. Bushphobic Extremists have become effective in their fear campaign to influence natural land managers, politicians and the media in their one dimensional theory that if bushland is not burnt to remove ‘fuel loads’ catastrophic firestorms will inevitably bring forth Armageddon. They preach that only the wholesale removal of forests will prevent wildfire. (Replacement with concrete would prevent it too.) Their constant evangelising reaches such irrational hysteria, that in order to appease them, HR Ops are promised and executed just to keep them at bay. False Sense of Security. ‘Much hazard reduction is performed to create a false sense of security’ (James Woodford, 8-9-2008). But how is burning remote bushland many kilometres from the human interface, allaying human security concerns? Yet hazard reduction is known to directly cause a sharp increase in fuel loads due to an unnaturally high and uniform germination of understory plants. Winter Idleness. Fire fighting naturally quietens off during the cooler wetter month of winter, and since Australian bushfire management agencies in the main only do bushfire management rather than throw on an SES jacket, multi-task in complimentary emergency management; many bushfire agencies are perceived (rightly or wrongly) as being idle over winter. So HR gives ’em all something to do! Richard Wagner’s “Ride of the Valkyries” is played and the boys play war games with real aircraft and real fire and causing real death and destruction. A giant napalm strike in the nearby jungle dramatically marks the climax of the battle. 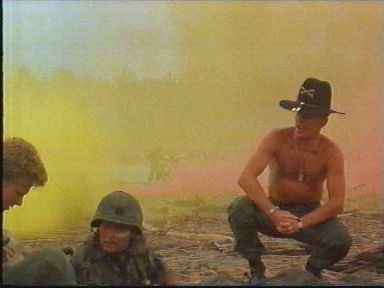 Kilgore exults to Willard, “I love the smell of napalm in the morning… The smell, you know that gasoline smell… Smells like … victory”, as he recalls a battle in which a hill was bombarded with napalm for over twelve hours. The Wildlife Service aerial incendiary boys must think of themselves as Special Forces. 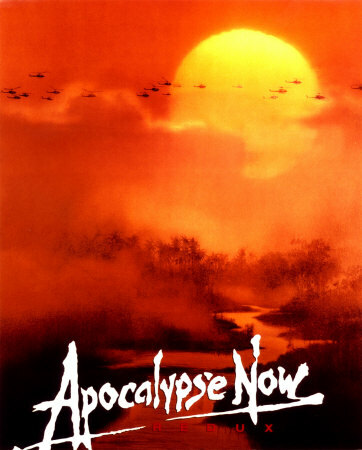 Perhaps there is a Colonel Kurtz among them – like an insane killer operating deep inside Laos. Kurtz’ final lines in the film are “The horror! 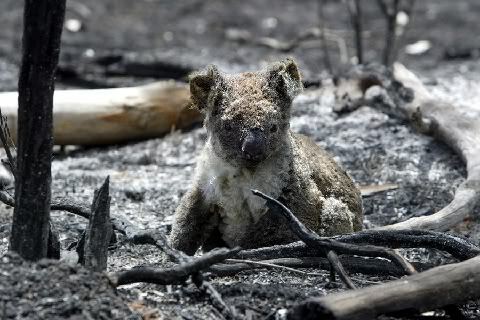 The horror!” How comparable with what is happening deep inside Australia’s wilderness areas, out of sight out of mind? …with extreme prejudice! How comparable is the US secret war fire bombing of Vietnam, Cambodia and Laos during the Vietnam War with the out of sight fire bombing by the Wildlife service of vast areas of Australia’s natural landscape? The legacy of the Wildlife Services’ aerial incendiary campaigns deep inside National Parks will be one remembered for fire bombing wildlife habitat from once natural and densely vegetated into a one unnatural, sterile and ghostly quiet. When it is too late, hazard reduction will be acknowledged by our children as naiive threatening process of our generation that drove Australia’s remaining wildlife into extinction. ‘The dangers of fighting fire with fire‘, by James Woodford, Sydney Morning Herald, 20080908, p.11, http://www.smh.com.au/news/opinion/the-dangers-of-fighting-fire-with-fire/2008/09/07/1220725850216.html (Accessed 20110523). This entry was posted on Saturday, May 21st, 2011	and is filed under Blue Mountains (AU), Threats from Bushfire.